The M905 is Grace Designs second generation stereo monitor controller, engineered from the ground up to provide unrivalled sonic purity with a comprehensive and powerful feature set. For hardworking audio professionals and studios that demand the very best playback available. The m905 represents a new benchmark for audio playback quality. DAC performance is on par with the finest esoteric mastering equipment available. The redesigned s-Lock™ PLL ensures ultra-low jitter clock regeneration. An asynchronous USB class 2 interface allows the m905 to act as the master clock of the computer’s USB audio buss, effectively eliminating interface induced jitter for computer audio playback. And finally, meticulous analogue circuitry measures with outstanding numbers in dynamic range, distortion and noise performance, ensuring bracingly open, detailed and musical playback of any input source. All main audio and power supply circuitry is housed in a 2U rack mount mainframe, while system control is managed by a sleek, ergonomic remote control unit. This new RCU is a combination of dedicated hardware and a colour graphical LCD display. All primary monitoring features are accessed via hardware switches and a rotary encoder, while all system information is presented by the graphic LCD and illuminated switches. This hybrid design allows for the solid feel and function of traditional hardware with the added power and functionality of a graphical user interface. Now supported is DSD 128x (5.6448MHz) via DoP v1.1 (DSD over PCM frames). DSD audio can be sourced from the AES3, S/PDIF or USB digital inputs. While still a niche playback format, DSD has held its ground over the years, and now more and more content is available via download. And playback is now supported by a number of players. DSD sounds stunningly natural, especially rendered through the rest of the playback circuitry of the m905. So If you’re the type to seek out this kind of fidelity, the m905 is a great way to enjoy it. The GUI is designed so that any engineer unfamiliar with the m905 can use the system immediately and confidently. Then with a minimal time investment, advanced functions can be accessed and controlled with ease. 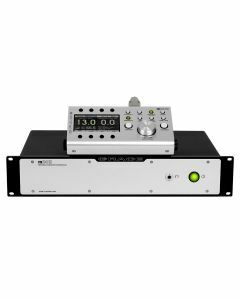 Additional features include: naming individual inputs and speaker outputs, calibrating level offsets of any input and output, setting preset levels, and much more. The setup menus only ever drill down one level, so the main operating screen is always one button away. And when returning to any previously visited setup menu, its previous edit status is remembered, keeping redundant navigation and editing to a minimum. The m905 offers the ability to transfer up to 10 channels of digital audio (8-channels of ADAT and two of AES3, or S/PDIF or TOSLINK) over USB to a computer, making the m905 capable of operating as a standalone USB audio interface. With stunning sonic performance and timeless design, the m905 is a mark of genuine progress in the pursuit of high quality audio production. Intuitive, reliable and beautiful, it is the perfect studio centerpiece – home base for your ears, eyes and hands. The m905 Analog is now available without the built in DAC. This system is offered for users who already have an investment in DACs, whether stand-alone or built into their interface. System configuration is exactly the same, with all the same great monitoring features, except no digital inputs and a second pair of balanced analog inputs. The m905 Analog brings this world class performance into reach of almost any engineer or recording studio. Also, users can always upgrade their m905 Analog to the Digital version at anytime.